“Ah!” said Lee. “I’ve wanted to tell you this for a long time. Any writing which has influenced the thinking and the lives of innumerable people is important. Now, there are many millions in their sects and churches who feel the order ‘Do thou’ and throw their weight into obedience. And there are millions more who feel predestination in ‘Thou shalt.’ Nothing they may do can interfere with what will be. But ‘Thou mayest’! Why, that makes a man great, that gives him stature with the gods, for in his weakness and his filth and his murder of his brother he has still the great choice. He can choose his course and fight it through and win.” Lee’s voice was a chant of triumph. Free will seems to be coming up a lot lately. “Thou mayest” is indeed different from both “thou shalt” and “do thou”. Funny, although we now theoretically have an egalitarian society, it would be interesting if we all had to switch to archaic English for a day. Who would be saying “you” and “thou” to whom? Where do the power structures really lie? Who serves, and who is served? I’ve only read a couple of Steinbeck books – under duress – and didn’t like them much. I don’t think I was ready for “The Pearl” in 8th grade, or for “Of Mice & Men” in 9th. But this is lovely. I might be ready for them now. Thank you so much for reading the passage. And thank you for your thoughts on language and power. I like the way your mind works, Alana. I do so hope you delve into “East of Eden” and love it as much as I did. Just remember to trust the author as you begin the novel…things change as you stay with it. Happy reading, dear one. Wonderful food for thought, Ann. 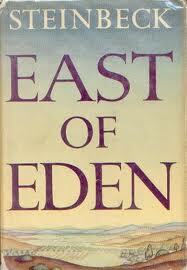 I’ll be suggesting my book group re-read East of Eden for a good discussion.